There are more than 430,000 jobs in Canada that are still unfilled! This is according to a business group that gives a warning about the worsening labor shortage in the country. 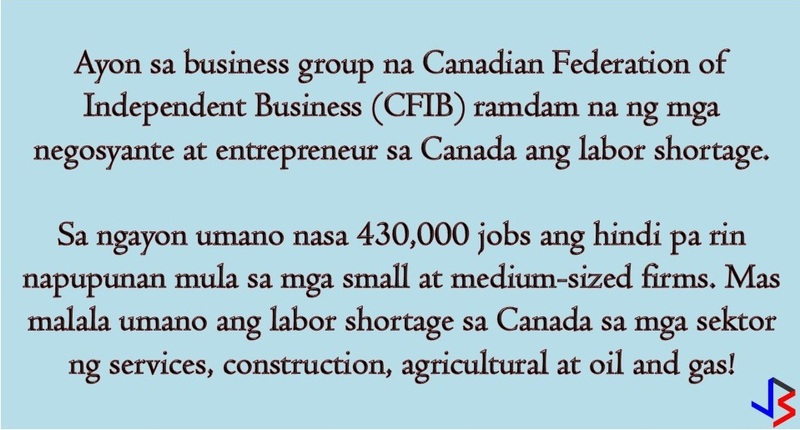 According to the Canadian Federation of Independent Business (CFIB), those jobs both include small and medium-sized firms that are still unfilled for at least four months. The job vacancy rate has risen to 3.3 percent, from 2.9 percent a year ago, the Canadian Federation of Independent Business (CFIB) said in a report. CFIB said that the data is above records set before the 2008 financial crisis and businesses are really feeling the pressure. Based on the government statistical agency, the unemployment rate fell to 0.1 percent in October and this is a near-record low of 5.8 percent. Prime Minister Justin Trudeau said this is not the right time to cut immigration due to the concern of entrepreneurs and businesses to the worsening labor shortage. For those who are thinking about what jobs can be applied in Canada? The following are the Philippine Overseas Employment Administration (POEA) approved jobs to Canada. This article is filed under hiring Filipino workers, Filipino workers, jobs in Canada, caregiver jobs, IT jobs, jobs near me and job site.